And he might have added, “It’s also the individual’s greatest burden – your own ‘unlived life.’” Taking a job you hate immediately forces you into an “unlived life.” And the longer you stay in the job, the less of your life you’re living. At some point we all take jobs we hate, usually because we need the money. My own worst job was as a garbage man on Christmas Eve. I was between high school and college, a young dad, and had bills to pay. That job was open temporarily, and I took it. Nothing wrong with the job itself – most work is honorable, and so is pitching trash. But it wasn’t how I saw myself (I wanted to be a writer), and the dissonance between my actual self and my imagined self was acutely painful. It didn’t help that it was raining (trash cans full of water are bad for the back) and it was Christmas Eve. But on the bright side, it made me appreciate all forms of cleaner, drier work. And I was able to buy some presents for the family. 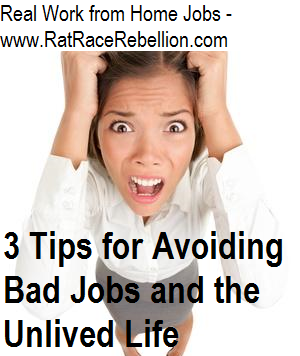 I’ve had a few other bad jobs, and they bring me to these three tips. 1. If money isn’t super-tight, don’t take a job just because it’s “convenient.” Inertia will set in – “Why should I look for a job if I’ve got one? It’s not that bad,” etc. – and your “unlived life” will grow longer. Indeed, your unlived life may swallow your lived life. 2. If the money knife is not at your throat, look first for jobs that you’d flourish in. If you can’t find that ideal job, “downgrade” your target jobs little by little. Don’t “settle” for the frog just because you can’t have the prince. The jobscape is big. Save the frog for last. 3. If you’re forced to take a bad job, upgrade as soon as you can. Remember, the goal is a fully-lived life. Even when the trash cans are full of rain. This entry was posted in Job Search Information and tagged bad jobs, ideal jobs. Bookmark the permalink.